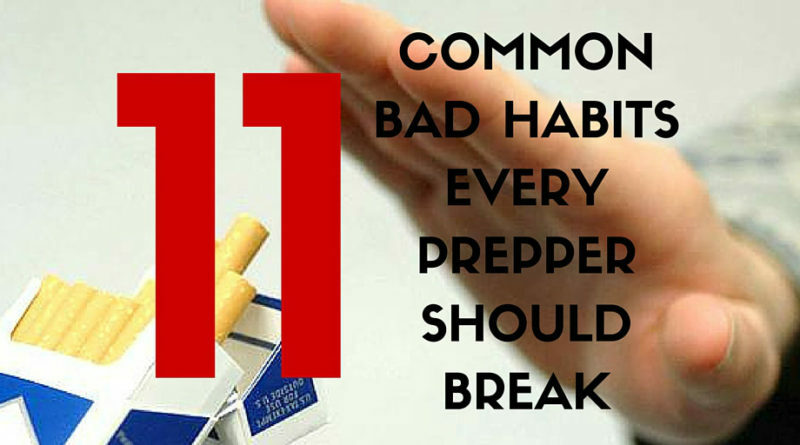 Bad habits are of course bad, but there are some that are important to examine as a prepper. Self discipline is the best way to combat bad habits, but the first step is being aware of them. 1. Skipping Hand Washing: Hand washing is the most important processes in hygiene, yet we skip this step all the time. Many of us also just go through the motions when washing our hands and do not sanitize them as best as we could. 2. Nail Biting: While this habit exposes you to germs on a regular basis, it is especially dangerous during a pandemic. Ingestion is one of the easiest ways to become infected for many threats. They make a clear nail coating to help break this habit that makes your nails taste foul- available at most grocery stores. Here is the highest reviewed nail coating on Amazon. You can also add a nail file to your EDC kit. 3. Sitting Around: Living a sedentary life is more common than you would think. Americans sit an average of over six hours a day! Getting up and moving is important to stay in shape. Sitting around may not get you far during a disaster. 4. Stress Eating: This habit can be especially dangerous to a prepper. With limited food stores during a stressful disaster, you may find yourself in a bind if you have not broken this habit yet. Compulsive eating is usually ‘mindless’ eating, so it may be difficult to identify this habit if you have it. If you can recognize the urge to eat, try distractions or breathing exercises until the temptation passes. 5. Not Enough Sleep: Sleep deprivation may be more common than you think. Experts suggest 7-8 hours per night for an adult. Almost half of American adults do not get this much sleep. Sleep deprivation can cause irrational decision making, anxiety, and long term risks. Remember, the saying “You can sleep when you’re dead” is not true at all. 6. Nose Picking: Anyone who claims they have never picked their nose is a filthy liar. However, this is a filthy habit that is similar to nail biting in that you are exposing yourself to germs. This is another mindless habit that is hard to break because it is hard to catch yourself in the act. Pavlok, is a wristband that shocks you when you succumb to a bad habit. It’s kind of like a dog collar for people, but it looks like a fitbit and helps you break bad habits. Here is a $20 off coupon if you are interested in one. 7. Smoking: Smoking has been blasted as a bad habit for several decades now, so we won’t go into too much detail. Mainly the extra resource you need to have for a chemical dependency just does not mesh well with the idea of prepping and self sufficiency. Vaporizers are also bad for emergencies, since they require charging and cartridges. 8. Not Brushing Teeth/Flossing: It takes two minutes to brush teeth, and not very long to floss either. Floss has many uses on its own, so it makes sense to use it for it’s original purpose as well. In disaster situations, a toothache is not what you need and dentists may be in short supply. 9. Overspending: While preppers are generally frugal, research oriented, and value savvy, we spend a good amount of money building up stores and buying gear. This provides the opportunity to overspend. If you are spending while in debt, take a step back and evaluate your financial position. 10. Skipping Breakfast: Breakfast is the most important meal of the day. We have all heard this several times, but it is a very important meal. It jump starts your metabolism after rest and provides much needed energy. If you do not like breakfast foods, try switching up what is on the menu to get a meal in during the early hours. 11. Phone Addiction: Last and not least, this habit is new within the past couple decades. Using a phone to escape social interaction, phantom vibrations, and constant screen time are all indications of a problem. Games, tools, email, and texting can contribute to mobile phone addiction. My new favorite game, Gold Monkey (a free game with no ads) is kind of like a mix between Sudoku and Minesweeper- it keeps you sharp while being easy to play and put down. It does not require a huge time investment, no “freemium” purchases, and is playable off grid with no internet connection. Knowing your limits is important, and we need to realize when we are using phones as a replacement for social interaction rather than a tool and try to balance our interaction. Brush up on any bad habits you noticed may apply to you, and share with your prepping friends to be sure they do the same.